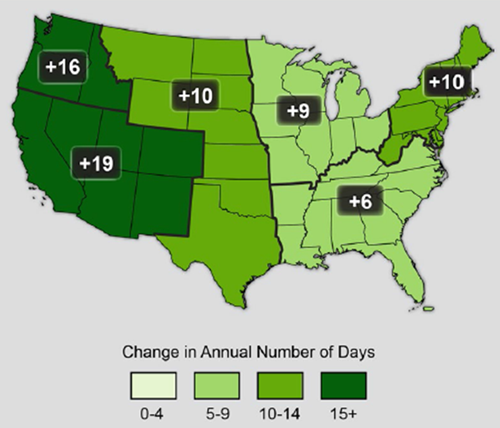 Climate projections displayed in this map represent an index known as Growing Degree Days (GDD: see text below for more information). Higher values generally represent longer, hotter growing seasons. Projections are for the years 2010-2080 using current data, or one of two IPCC greenhouse gas concentration scenarios: a moderate emissions scenario (RCP 4.5) and a high emissions scenario (RCP 8.5). Climate projections were developed by a University of Massachusetts Amherst team for the Northeast to evaluate the potential effects of climate change on wildlife habitat and ecological integrity from 2010 to 2080. Data courtesy of North Atlantic Landscape Conservation Cooperative. Use checkboxes to turn layers on or off. For the best representation of overlapping layers, view them one at a time. Slide the toggle bar in the legend to change the transparency of map layers. Because fish, wildlife, and plant species may be shifting the timing of these life cycle events in different ways, shifting seasons and phenologies result in mismatched encounters among dependent species that historically would have overlapped at the same place and time. Mismatches between food and habitat resources can lead to negative impacts on fish and wildlife individual fitness, population success, and overall community structure and function, especially when species are unable to change their behaviors to take advantage of other existing resources of similar quality. Shifts, particularly during spring, have been the focus of much research. Spring has begun to arrive earlier by over a week in New England over the last half century; however, while the average date of the last spring frost is getting earlier, temperature fluctuations are also on the rise. This can potentially increase risk of frost damage as well as animal exposure to low temperatures or late season winter storms. In some cases, frost damage can impact the overall productivity? of plants for the entire growing season. For example, a frost event in late-spring following an early leaf-out could damage newly developed leaves, flowers, or young animals, which could reduce productivity, and result in mortality. Warmer winter and early spring temperatures are also leading to earlier snowmelt and the breakup of winter ice on regional water bodies. This is leading to a shift in the timing and magnitude of spring water flows that fish and other aquatic or wetland species depend on for migration, spawning and development of young. Winter-spring flow rates peak approximately 6 days earlier than they did 50-90 years ago in Massachusetts. This trend is projected to continue during the 21st century. In addition, a shift toward higher winter flows and lower spring flows has been documented using climate-driven streamflow simulations for the Connecticut River Basin as well as just to the north in New Hampshire at the Hubbard Brook Long Term Ecological Research Station. Future climate projections using a high emission scenario show continued lengthening of the frost-free season across New England by at least 19 days by the year 2055, and as much as 1 – 2 months by the end of the century, depending on the emissions scenario. Lengthening of the frost free season during 1991 – 2012 relative to 1901 – 1960. Figure from Walsh et al. 2014. More growing degree days are also expected. Growing degree days (GDD) is an index that measures accumulated warmth. GDDs are additive, and so they accumulate day after day throughout the growing season as Accumulated Growing Degree Days (AGDDs). Once enough GDDs have occurred in sequence and a specific growing degree threshold is surpassed, reoccuring life event cues including phenological transitions (e.g., migration, hibernation) and biological events (e.g., blooming, leaf-out) are triggered. Growing degree days are calculated for a given day with the average of the daily low and daily high temperatures, minus a base temperature. Base temperature varies by species, though a standard reference temperature (often 50 °F or 65 °F) is generally used in weather reports. GDDs begin accumulating, depending on the program and method of research, either January 1st or March 1st each year and eventually reach the growing degree threshold. Between 1895 and 2011, there has been a strong increase in GDD in Massachusetts and the Greater New England region due to shorter winters and longer summers. Projections estimate an increase in GDD of over 35-41% in the Northeast over the next several decades. An earlier shift in spring of GDD and the timing of when GDD become large enough to trigger biological events will be important in determining what vegetation can continue and expand into Massachusetts; for example, plants that have historically been found in southern states may shift their geographical ranges into Massachusetts, while species that prefer colder temperatures may become less common and shift their range out of the state. 1. Augspurger, C. K. 2013. Reconstructing patterns of temperature, phenology?, and frost damage over 124 years: Spring damage risk is increasing. Ecology 94:41-50. 2. Burrows, M. T., Schoeman, D. S., Buckley, L. B., P. Moore, E. S. Poloczanska, K. M. Brander, C. Brown, J. F. Bruno, C. M. Duarte, B. S. Halpern, J. Holding, C. V. Kappel, W. Kiessling, M. I. O’Connor, J. M. Pandolfi, C. Parmesan, F. B. Schwing, W. J. Sydeman, and A. J. Richardson. 2011. The pace of shifting climate in marine and terrestrial ecosystems. Science 334: 652-655. 3. Campbell, J. L., S. V. Ollinger, G. N. Flerchinger, H. Wicklein, K. Hayhoe, and A. S. Bailey. 2011. Past and projected future changes in snowpack and soil frost at the Hubbard Brook Experimental Forest, New Hampshire, USA. Hydrological Processes 24:2465-2480. 4. Enquist, C. A. F., J. L. Kellermann, K. L. Gerst, and A. J. Miller-Rushing. 2014. Phenology research for natural resource management in the United States. International Journal of Biometeorology 58(4): 579-89. 5. Gu, L., P. J. Hanson, W. Mac Post, D. P. Kaiser, B. Yang, R. Nemani, S. G. Pallardy, and T. Meyers. 2008. The 2007 Eastern US spring freeze: Increased cold damage in a warming world? BioScience 58:253-262. 6. Hayhoe, K., C. P. Wake, T. G. Huntington, L. Luo, M. D. Schwartz, J. Sheffield, E. Wood, B. Anderson, J. Bradbury, and A. DeGaetano. 2007. Past and future changes in climate and hydrological indicators in the US Northeast. Climate Dynamics 28:381-407. 7. Hodgkins, G. A. and R. W. Dudley. 2006. Changes in the timing of winter-spring streamflows in eastern North America, 1913-2002. Geophysical Research Letters 33:L06402. 8. Hufkens, K., M. A. Friedl, T. F. Keenan, O. Sonnentag, A. Bailey, J. O'Keefe, and A. D. Richardson. 2012. Ecological impacts of a widespread frost event following early spring leaf-out. Global Change Biology 18:2365-2377. 9. Horton R., W. Solecki, and C. Rosenzweig. 2012. Climate change in the Northeast: A Sourcebook. Draft Technical Input Report prepared for the U.S. National Climate Assessment. 313 p.
10. Inouye, D. W. 2008. Effects of climate change on phenology, frost damage, and floral abundance of montane wildflowers. Ecology 89:353-362. 11. Kunkel, K. E. 2013. Regional climate trends and scenarios for the US National Climate Assessment. US Department of Commerce, National Oceanic and Atmospheric Administration, National Environmental Satellite, Data, and Information Service. 12. Martin, M., K. Gavazov, C. Koerner, S. Haettenschwiler, and C. Rixen. 2010. Reduced early growing season freezing resistance in alpine treeline plants under elevated atmospheric CO2. Global Change Biology 16:1057-1070. 13. Marshall, E. and T. Randhir. 2008. Effect of climate change on watershed system: a regional analysis. Climatic Change 89:263-280. 14. Miller-Rushing, A. J., T. T. Hoye, D. W. Inouye, and E. Post. 2010. The effects of phenological mismatches on demography. Philosophical Transactions of the Royal Society B-Biological Sciences 365: 3177-3186. 15. Ning, L., E. E. Riddle, and R. S. Bradley. 2015. Projected Changes in Climate Extremes over the Northeastern United States. Journal of Climate 28:3289-3310. 16. Norby, R. J., J. S. Hartz-Rubin, and V. M. J. 2003. Phenological responses in maple to experimental atmospheric warming and CO2 enrichment. Global Change Biology 9:1792-1801. 17. Peterson, A. G. and J. T. Abatzoglou. 2014. Observed changes in false springs over the contiguous United States. Geophysical Research Letters 41:2156-2162. 18. Rigby, J. R. and A. Porporato. 2008. Spring frost risk in a changing climate. Geophysical Research Letters 35:L12703. 19. Walsh, J., D. Wuebbles, K. Hayhoe, J. Kossin, K. Kunkel, G. Stephens, P. Thorne, R. Vose, M. Wehner, J. Willis, D. Anderson, S. Doney, R. Feely, P. Hennon, V. Kharin, T. Knutson, F. Landerer, T. Lenton, J. Kennedy, and R. Somerville, 2014: Ch. 2: Our Changing Climate. Climate Change Impacts in the United States: The Third National Climate Assessment, J. M. Melillo, Terese (T.C.) Richmond, and G. W. Yohe, Eds., U.S. Global Change Research Program, 19-67. 20. Willis, C. G., B. Ruhfel R. B. Primack A. J. Miller-Rushing, and C. C. Davis. 2008. Phylogenetic patterns of species loss in Thoreau's woods are driven by climate change. Proceedings of the National Academy of Sciences 105: 17029-17033.